The State Commission on Judicial Performance unanimously recommends that Justice Allison H. Eid BE RETAINED. Two commissioners recused. 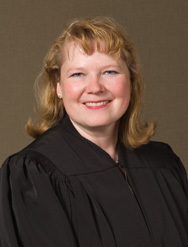 Justice Eid was appointed to the Colorado Supreme Court in 2006. She grew up in Spokane, Washington, and graduated from Stanford University and from the University of Chicago Law School, where she was articles editor of the law review. She is the Supreme Court ’s liaison justice to five of the court’s committees, which has included work to improve the Supreme Court library. She is also an adjunct professor at the University of Colorado School of Law. Before her appointment to the Court, Justice Eid was the Solicitor General of the State of Colorado, representing Colorado officials and agencies in state and federal courts; an associate professor at the University of Colorado School of Law, where she taught constitutional law, tort law, and statutory interpretation; and an attorney with the Denver office of Arnold & Porter. She clerked for United States Supreme Court Justice Clarence Thomas and for United States Court of Appeals for the Fifth Circuit Judge Jerry E. Smith. Justice Eid’s high standard for proficiency and efficiency reflects her enthusiasm for her work. Attorneys who responded to survey questions rated Justice Eid above average for: (1) writing opinions that are clear, that adequately explain the basis of the court’s opinion, and that are well-reasoned, based on the law and facts; and (2) being well-prepared for oral argument. Attorneys also commented that she was fair and impartial. Judges who responded to survey questions rated her above average for writing opinions that are clear and that adequately explain the court’s decision. The Commission reviewed a variety of Justice Eid’s opinions and concluded that they were clear, concise and very well-written. Because of her prior role as Solicitor General, Justice Eid followed the court’s custom and recused herself from a large number of cases during her first year on the bench. She wrote far more concurring and dissenting opinions than other justices. Overall, 91% of attorneys surveyed and 96% of judges surveyed supported Justice Eid’s retention, with 88% of attorneys and 81% of judges strongly recommending that she be retained in office.